Over 100 mourners from Ottawa’s diverse communities were at the Sir John MacDonald Building on Wellington Street for a memorial service for the 157 passengers who died in the Ethiopian Air Lines crash on Sunday 10 March 2019. 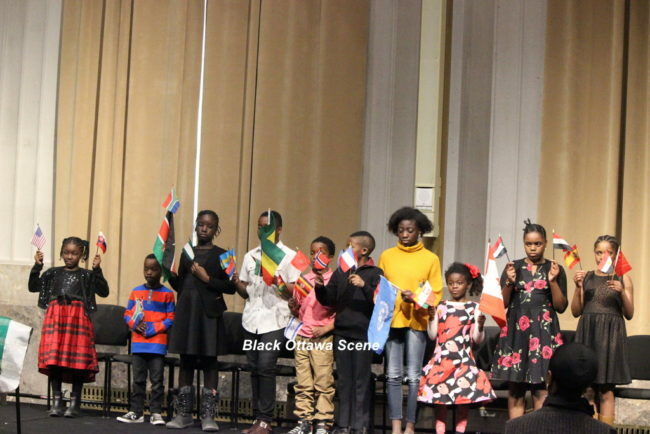 Organised by the African Canadian Association of Ottawa, the event featured prayers, tributes and somber light entertainment, against a backdrop of side show with photographs of all the deceased. MC was Black History Ottawa Community Outreach Officer, Sarah Onyango. Aptly attired in a black funeral outfit, she deftly guided the mourners through the painful process of remembering and consoling the families and friends of those who had embarked on that fateful flight, including two residents of Ottawa. Among the mourners were Members of Parliament Greg Fergus and Chandra Arya; High Commissioner for the the Republic of Cameroon, His Excellency Anu’a-Gheyle Solomon Azoh-Mbi; Burundi Charge d’Affairs Her Excellency Shakilla Umutoni; and President; CEO, United Nations Association in Canada Kathyrn White and Black History Ottawa President June Gurvan. Pastoral prayers and tributes were led by Rev. Anthony Bailey and Rev. Albert Kaumba. Passengers from more than 30 countries were on board the Ethiopian Airlines flight from Addis Ababa to Nairobi that crashed on 10 March, killing 157 people. Among the victims were 32 Kenyans, 18 Canadians, nine Ethiopians and seven Britons, according to a passenger list published by Ethiopian officials. The UK Foreign Office said two of the victims travelling on non-British passports were Britons with dual-nationality, bringing the total number of British victims to nine. UN Secretary-General António Guterres described the crash as a “global tragedy”. A number of passengers are believed to have been affiliated with the UN. A former Kenyan football administrator, a “stellar” US student and a Slovakian MP’s family all died in the crash. One Kenyan man lost his wife, daughter and three grandchildren, while a Canadian family of six also died on flight ET302. One of the youngest passengers was just nine months old.